*Modified with DesktopX 3.50 Professional. Tested on Windows Vista Ultimate SP1. 1. Run (or open) the gadget. 4. Click on the Clock to return back. *Also you may download and use the previous version of SD Clock: Link if you have DesktopX installed. Very nicely done! Thanks for sharing! Works perfectly! � �this gadget is.......... AWSOME! I LOVE IT. Good job man. Much better and I have no problems with this clock at all. You do fantastic work~!!! I love the looks of this but I cant seem to get this or the earlier version to work. Any suggestions would be greatly appreciated as I would really like to use this. I have version 3.49f (rc) .016 of DesktopX Professional. As an additional note to the above post, the error message I get in the place of the clock is "Problem accessing DesktopX sidebar framework". Sorry but I can't understand your problem. This clock is a standalone gadget and you don't need DesktopX to run it. You just need unpack the zip file. 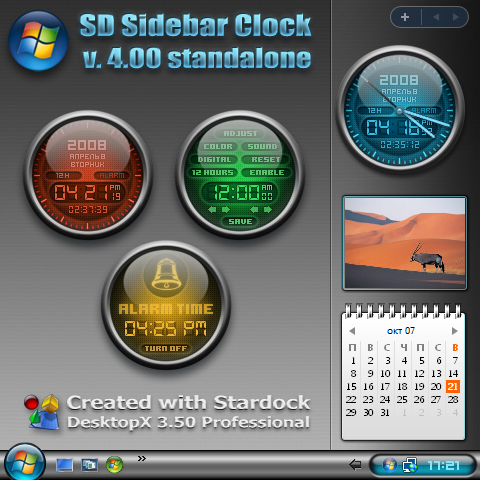 Then double click on the file: SD Sidebar Clock 3.04.gadget. It must be automatically installed to the Vista Sidebar. However try go here: WWW Link and look at the Comment #9 and Comment #11. I renamed the en-US Folder to de-DE and it did not work! One question: What is the additional time at the bottom and is it possible to set it?